Europe’s biggest ram sale, the Wales & Border Ram Sales, is gearing up for what is expected to be one of its most successful events in recent years. 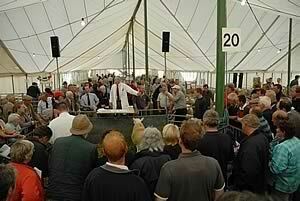 Entries are up four hundred on last year at nearly 6,000 sheep, with increased numbers across most breeds. The Roussin and Southdown breeds are back after an interval of a few years. Chairman Gwynne Davies said:"People are looking for better quality rams and by coming to Builth, you are buying from the top breeders in the UK and getting the best quality rams that will help to produce even better quality lambs. "There’s also the advantage that by buying at the main Wales and Borders ram sale, you get the choice of so many breeds and you can take your pick in one location. It gives you the edge if you buy a top quality ram and can get your lambs away that little bit earlier – with the price of fertiliser these days even a fortnight earlier will save on grass." The main sale will be building on the success of this year’s early ram sale saw 433 sheep sold, an increase on last year, with a top price of 1500 guineas for a Texel ram. The turnover reached nearly a quarter of a million pounds with a good turnout of buyers. It will be held at the Royal Welsh Showground on Monday 19 September. Sponsors include, Ketchum and Symtag. Novartis will sponsor the Tup Taxis, which once again will be on hand to keep traffic down by ferrying sheep from the sale to the purchasers’ transport.